Earlier this week, Voyager 2 became the second human-made object to reach interstellar space. Yet it has a long way to go before it actually leaves our solar system. Here’s why. Five years ago, when the first Voyager earned the designation as first Earth-built thing to go interstellar, it got the nod because it had traveled beyond the heliosphere, a bubble surrounding our sun encompassing an area that’s primarily influenced by the sun’s energy fields. The heliosphere is important in keeping dangerous cosmic rays from the interstellar medium out of the main areas of the solar system. When Voyager 1 left the boundary of the heliosphere, it entered an area of space primarily influenced by the interstellar medium, or the space between stars. But even though the spacecraft has left the heliosphere behind, it’s nowhere near leaving the solar system. Some simple numbers to spell it out: Distance in the solar system is measured in astronomical units (AU), which is the distance between Earth and the sun. Neptune, the most distant known planet, is 30 AU out. The two Voyager crafts are 145 and 120 AU from here, respectively. The most distant solar system object we know about is V774104, a dwarf planet that sits at 103 AU. But plenty of objects have strange orbits that take them much, much further away. Sedna, currently 85 AU, can swing out as far as 936 AU. There’s also an area beyond that we have circumstantial evidence of called the Oort Cloud. It starts at about 2,000 AU—and doesn’t end for nearly 50,000 AU, even at minimum estimates. That means our solar system, which is defined by objects still in a gravitational orbit around the sun, could stretch out a light-year or more. 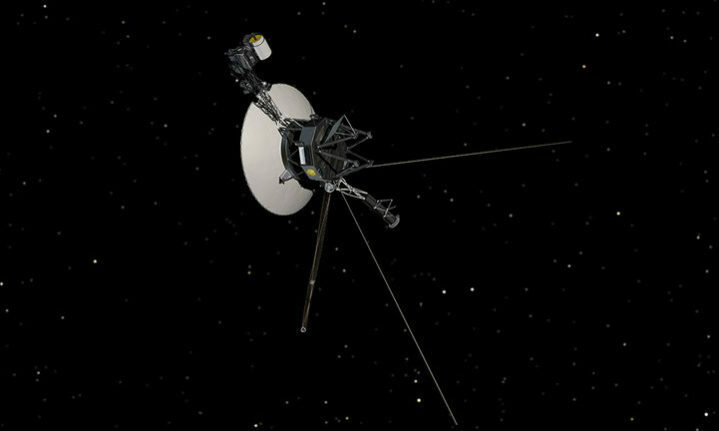 “The Voyagers won’t get to the Oort Cloud for another 300 years, and won’t get out of the Oort Cloud for at least 3,000 years,” says Suzanne Dodd, program manager for the Voyagers. The Oort Cloud is a mysterious place. The material that lives way out here is left over from the formation of the solar system and was cast out by the influence of the four gas giant plants, but didn’t have enough speed to completely leave the influence of the sun. Kat Volk, a planetary scientist at the University of Arizona who studies the outer solar system, says seeing the actual Oort Cloud isn’t possible with most modern instruments because it’s mostly comets and other icy objects too small and dim and distant to spot. But sometimes, comets from the Oort Cloud get a gravitational nudge from another object (including passing stars) and come into the closer parts of the solar system. Based on their speed, we can calculate their orbits and figure out how far they stretch out to at their farthest point from the sun. While the planets live close to the ecliptic plane—a bit of an “equator” for the solar system based on the sun’s gravity—the Oort Cloud is more of a spherical bubble around the sun. “It really is a cloud structure instead of a disk structure where you have these objects that are really evenly distributed,” Volk says. And the Oort Cloud may not be just comets and debris. There are likely dwarf planets out there, and Volk says there could even be bigger objects somewhere in the region—even potentially undiscovered and extremely-hard-to-discover small terrestrial planets. “It’s perfectly reasonable that there should be a lot of quite sizable objects in that population,” Volk says. So Voyager 2 isn’t anywhere close to out of the solar system. It may not even be past the distance of the planets. And while the craft may be in interstellar space, Dodd says there’s always a chance it could be bumped back into the heliosphere. “If the solar wind or something else were to blow a little bit harder, you could go back into the heliosphere and see more particles from the sun,” Dodd says. There’s a long road ahead for the intrepid craft, which have about seven years left of battery life before they’re no longer able to transmit back to Earth. They may be in interstellar space, but leaving one’s home solar system behind is a harder task than you might think.